From the play’s first moments, thanks largely to the incredible set, the audience is completely drawn into the Wyeth household drama, and once Baitz’s crackling dialogue begins, resistance is futile. This is a classically well-made play about the theater of family: how each member chooses and plays a role, some more forcefully than others. There are no gimmicks as the drama unfolds over a couple of fraught December days. Whether this is a family breaking apart or ultimately pulling together isn’t revealed until the last moments of the two-hour play. Expertly directed by Richard Seer, this cast performs with such precision it’s hard to imagine anyone better in the roles. Chappell dominates the stage as the powerhouse Polly, a bright woman so devoid of compassion (yet not of love) for her children it’s almost shocking to hear some of the things that come out of her mouth. She’s brutal but she’s also funny, which makes her irresistible. 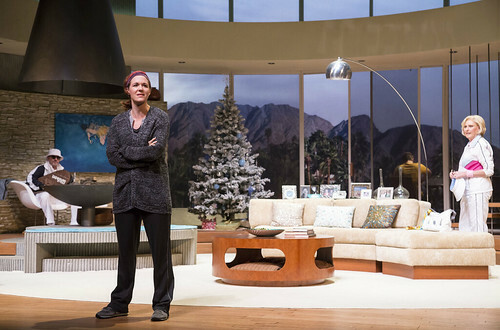 I interviewed playwright Jon Robin Baitz and Other Desert Cities leading lady Kandis Chappell for a story in the San Francisco Chronicle. Read the feature here. Other Desert Cities continues through Sept. 15 at the Mountain View Center for the Performing Arts, 500 Castro St., Mountain View. Tickets are $19-$73. Call 650-463-1960 or visit www.theatreworks.org.